This pages gives instructions on how to install the MAM database on your computer. This database was created by Wise Owl for private use. Neither the database nor any part of this tutorial can be redistributed in any form whatsoever, or for any purpose, without the prior written permission of the author. Choose to extract all of the files (there is only one!) from this zipped file. This screen dump is for Windows 7, but other Windows versions will be similar. Eventually you'll be able to extract the SQL script. You can also press CTRL + O to do this. Choose to open this file. 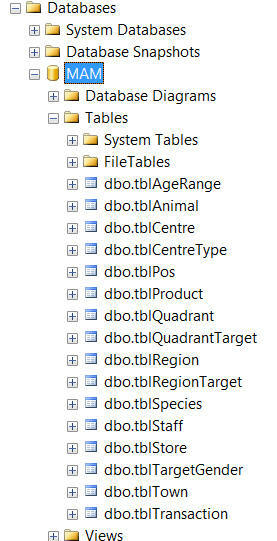 The start of the (long) script to generate the database and its tables. Either click on this tool or press the F5 key. On my laptop this took 13 seconds, but yours may take quite a bit longer. 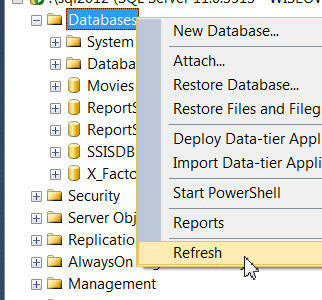 Right-click on Databases and choose to refresh the list. The tables in the MAM database. You're now in a position to continue with the rest of this tutorial!